Interview given by Bishop Victor of Barushevka, head of the UOC representation to European international organizations, to the Information and Education Department of the Ukrainian Orthodox Church. – Your Eminence, in recent days, voices have been heard from various resources about a danger for the parishes of the Ukrainian Orthodox Church, considering that the Ukrainian Supreme Rada has adopted Bill No. 5305 providing for a change in the names of our Church’s religious organizations. What can you say about this? – I would like to note that actually the adopted Bill No. 5309 applies only to the religious organizations having governing center located in the state recognized by law as a state that has carried out a military aggression against Ukraine and has temporarily occupied the territory of Ukraine. However, the Ukrainian Orthodox Church is subject to the governing center located in Kiev. For this reason, this law does not apply to our organization. – Yes, but perhaps the Ukrainian Ministry of Culture and other state bodies will see it otherwise. In this case, what the religious organizations of the Ukrainian Orthodox Church are to expect? – We understand that in this particular historical period, certain political forces, which are in power in Ukraine today, have chosen to put pressure upon our confession. That is why we are called to defend people’s rights against the arbitrariness of power bodies. If public servants interpret this law arbitrarily and demand that the names of the Ukrainian Orthodox Church’s communities should be changed, then our religious organizations will have the right to challenge the actions of such public servants or state bodies in court, and this means that lawsuits will continue in Ukraine. – What are the prospects of such disputes, in your view? – From the legal point of view, there are prospects as, indeed, even the Ukrainian Supreme Rada chief office of scientific expertise has made a negative assessment of this bill and recommended that it should be declined. I would like to point out that, as the office affirms, this bill ‘goes beyond the limits established by respective provisions of Article 35 of the Constitution and Ukrainian Law ‘On Freedom of Conscience and Religious Organizations’, according to which the exercise of the right to freedom of worldview and faith can be limited by law only in specific cases’. Quite eloquent is also the quotation from Par 3, Item II of the conclusion of the same office, noting that ‘considering the above, there are grounds to believe that the bill provisions contain signs of contradiction to the Ukrainian Constitution which exclude any possibility for establishing special demands with regard to the names and content of the statutes (provisions) of religious organizations (associations)’. Thus, specialists in law in both state and non-stat sphere are well aware that the law on changing the names of religious organizations is an unsuccessful political step. There are also other guarantees of respect for the rights and freedoms of believing citizens. In particular, according to the Ukrainian Constitution Article 22, in adopting new laws it is not allowed to decrease the volume of human rights and freedoms, that is to say, if the faithful have had the right to confess their views as members of a religious community with certain unique name, they preserve the same right also in future regardless of what is provided by a new law; indeed the Ukrainian Constitution has the highest legal force. Besides, at the stage of application of this law, public servants may encounter problems: indeed, actually they have no right to prohibit a religious organization from putting any names on its facilities or in its corporate details. – How will the adopted Bill 5309 be assessed on international level? – Unfortunately, by adopting this law our politicians have again offered an opportunity for criticizing soundly the level of legal culture in Ukraine. The European standards in various spheres, including the quality of the legal system for respect of human rights, do not allow the state power to make such steps as made by this law – which will become for a long time ‘a black spot’ in the history of Ukrainian parliamentarism and will resound on international level as an example of ill-considered political step. Of course, all the experts and international organizations, which have already received the text of this law, obviously see that it violates human rights and aims at putting unlawful pressure on one confession – the Ukrainian Orthodox Church. The international community is aware of the value of human rights and the need to respect the established legal order, while the adopted Bill No. 5309 manifests an apparent disregard for the European legal values on the part of Ukrainian legislators. 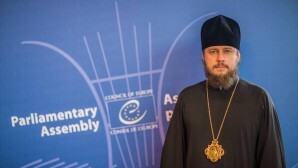 In case the religious organizations of the Ukrainian Orthodox Church are subjected to increasing pressure, the number of complaints to be sent to the UN Human Rights Council, UN special rapporteurs, European Court for Human Rights and other international instances will increase – which cannot but lead to an adequate legal response by these institutions. However, as it is important for every state not to allow such state of affairs when its citizens begin complaining en mass about violations of their rights, we do not give up the hope that the disputed situation, if any, will be resolved positively at the level of the national legal system.